A heavyweight, 140 lb (300 gsm) paper with a cold press surface to accept a variety of watercolor techniques. Priced especially for the beginner. Acid-free. 12-sheet pads. Spiral bound on the short side. Pads now feature actual size sheets when paper is trimmed from the binding. Strathmore Artist Papers has been manufacturing watercolor papers for more than 70 years. Boasting one of the broadest ranges of watercolor papers of any manufacturer, artists are sure to find a paper that is suited to their level of expertise and technique within the Strathmore product range. 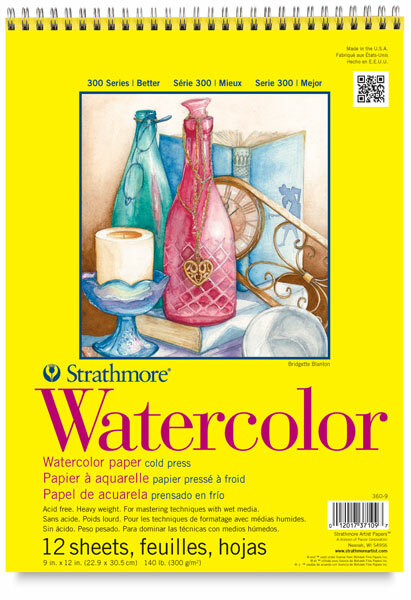 All Strathmore watercolor papers are made with watercolor felts, giving each paper a traditional watercolor paper look and feel. All are acid-free to ensure longevity, and made using natural and synthetic sizing, in keeping with Strathmore’s strong environmental stance.